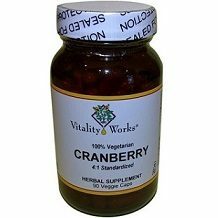 We’ve taken a look at Vitality Works Cranberry which is a natural product designed to relieve its customers of a urinary tract infection. 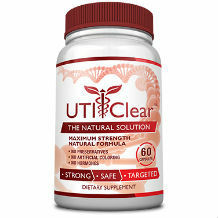 We’ve assessed the quality of this product based on the ingredients and dosage of these ingredients and the customer service that the manufacturer offers, in order to determine if this is one of the best cranberry based natural products for relief from urinary tract infections. The only active ingredient in this product is dried cranberry juice. Cranberry juice contains molecules called phenols. Phenols can act as a mild antibacterial because they interfere with the bacterial cell membrane. The use of cranberry juice as an antibacterial has been well investigated and scientist have determined and that it is absorbed well and reaches the urinary tract in a matter of hours. Cranberry juice is also high in antioxidants. Antioxidants react with and neutralize toxic chemicals, called free radicals, that are at abnormally high levels near the sites of infection. If free radicals are left without antioxidants, they cause more tissue damage and inflammation. So antioxidants help to reduce inflammation. While these actions of cranberry juice are beneficial, it should not be the only natural ingredient used to relieve a urinary tract infection. Some other ingredients have also been just as well researched. For example, d-mannose could have been included to prevent the infecting bacteria from sticking to the wall of the urinary tract. The product is in a capsule form. One capsule can be taken one to three times per day. Each capsule contains 400 mg of dried cranberry juice. This is the equivalent of eating 1600 mg of the raw berry. There aren’t any major adverse effects reported when taking cranberry, but customers who are on chronic medication, especially blood thinners like Warfarin, should consult a doctor before using the supplement. The price of 90 capsules when purchased online is $9.95. This is quite a low price compared to the competitors of this product but it is likely because there is only one ingredient, which generally isn’t that expensive to manufacture. We couldn’t find any evidence of a guarantee for this product. This is fairly understandable given the low price of the product and the simplicity of its ingredients. So it really comes down to if customers are willing to gamble a small amount of money to see if this cheap product will work or not. The price of Vitality Works Cranberry is really quite low because it only contains one ingredient. Cranberry juice is fairly effective at relieving a urinary tract infection, but this supplement which contains only cranberry juice, will not be as effective as a supplement with more ingredients that are working together to tackle the problem from different angles. This is an even bigger problem because no guarantee is offered on Vitality Works Cranberry so customers may waste their money buying it, even though it is cheap.